Stock photo of high rise buildings, architectural detail, people, and blue sky outside Brookfield Place in the Financial District of downtown Toronto. Architecture and People, Financial District, Toronto, Ontario, Canada. 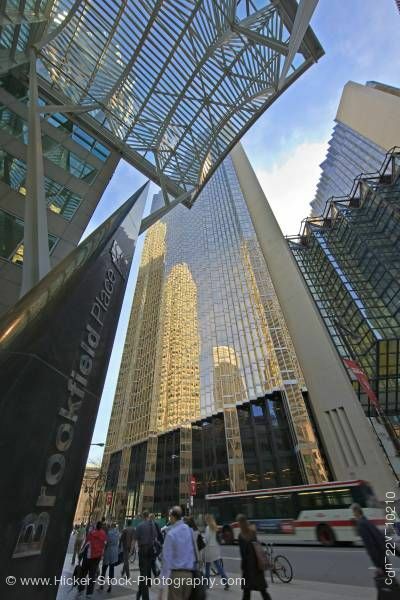 This stock photo includes modern high rise buildings with people walking through the financial district outside Brookfield Place in downtown Toronto, Ontario, Canada. Tall shiny buildings rise up inside this picture behind a busy passersby showing movement. the upper right corner is filled with the image of architectural glass work on one of the buildings. Sunny blue sky with little cloud cover tops off this street scene in the financial district of downtown Toronto in Ontario, Canada.